Every Husband's Nightmare Bazaar is celebrating more than 30 years and returns to the Washington County Fairgrounds on Nov. 12. Holiday bazaar season is right around the corner — and in Hillsboro, one local bazaar has been encouraging holiday shoppers for more than three decades. The "Every Husband's Nightmare" bazaar gathers more than 65 creative-types to sell their wares in one spot just in time for Christmas, offering everything from vintage clothing to dishes, house and garden decor, homemade jewelry and nostalgic Christmas items at the Cloverleaf Building of the Washington County Fairgrounds, 873 N.E. 34th Ave. The bazaar runs from Nov. 12 to Nov. 16. Monday, Nov. 12 is early admission night beginning at 5 p.m. with first buying privileges for a $3 donation to local charities. Tuesday through Friday, and 10 a.m. to 5 p.m. with free admission those days. Celebrating the bazaar's 31st anniversary, owner Jackie Lee said being in the bazaar circuit is "in her blood." She's ready for waves of holiday shoppers expected to attend the bazaar this month. She took inspiration from growing up around a gift shop and carried the setting into the bazaar, she said. "My mom used to do a show in Forest Grove," said Lee, who bought Every Husband's Nightmare 11 years ago from its original owner, Sharron Hill. "I just grew up doing that. I helped at a gift shop when I was 16 and 17, and then I began helping out Sharon." While other shows are set up with individual booths, Every Husband's Nightmare is set up like a boutique. Lee describes it like coming into a store, divided into sections by category like jewelry, vintage and others. "Everyone is local," Lee said. Some vendors, artists and craftsmen come as far as Salem to be a part of the scene. The value of buying vintage and homemade for the holiday season is about putting in extra thought, Lee said. "It is more personalized," she said. "The average person has anything that they want and can go buy. 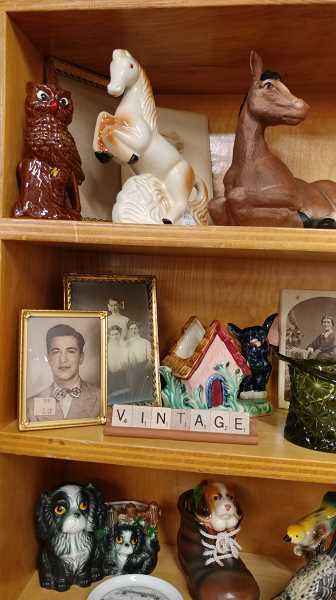 You aren't going to find a handmade or vintage piece anywhere." What first started at Jackson Schoolhouse quickly outgrew the space, ultimately moving to the fairgrounds' main exhibit hall for years before starting to be set up in the Cloverleaf Building. Lee said thousands of shoppers come to the bazaar during the week, and over 50,000 items sell each year. Lee is a juvenile probation officer in Yamhill County when she isn't operating Every Husband's Nightmare. "It is something completely different than my profession, which is super serious and crazy," she said. The bazaar is extreme craziness in the opposite direction." For more information about becoming a vendor, visit its website.